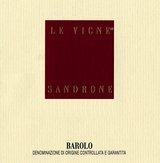 "Le Vigne" Barolo is a unique wine created from four different Nebbiolo vineyards, each of which brings its own contribution. This union generates an exceptionally complex wine that is round and harmonious on the palate, with fruity and spicy notes. Great stuff, combining traditional Barolo flavors-dusty earth, leather, floral notes and cherries-with modern touches, like the supple tannins and hints of hickory smoke. This is a big, powerful wine that manages to be burly without being clumsy, intellectually challenging and complex while still delivering lush fruit. Drinkable now, but better several years from now. Wonderful aromas of roses, berries and violets follow through to a full-bodied palate, with fine tannins and a pretty, caressing finish of sweet fruit. Pretty wine. Best after 2006. Tasted twice, with consistent notes.